Health Law Professor John V. Jacobi was featured in Time magazine on the newest lawsuit filed against Purdue Pharma. Judge Patricia K. Costello '74 gave a CJSA lecture on "The Role of a Chief Judge: Managing Crises and Improving the System." Law Professor Margaret K. Lewis published an op-ed in the Washington Post on China's "mockery" of its human rights treaties. MPA Alumna Begins "Dream Job"
MPA graduate, Ashley Manz, recently joined Mayor Fulop as Senior Public Information Assistant for Jersey City. John Paitakes, professor of criminal justice, has been invited to present his book 50 Years Working in Criminal Justice. Mark McGuire will meet with government officials and others Israel during this two-week journey with fellow student leaders. Matt Hale looks forward to using material he teaches in public administration classes in his real world role on council. Joseph Murante and Emily Silkowski have wrapped up a three-month long internship for the Superior Court of NJ. Law Professors from the Center for Social Justice published a feature Op-ed in the New Jersey Law Journal. Catherine Kiernan, Esq. was chosen by NJBIZ for a Lifetime Achievement award in its 2018 General Counsel of the Year Awards. Law Professor Margaret Lewis appeared in a number of articles regarding the UCLA basketball players detained in China. Law Dean Kathleen Boozang was featured in an NJTV interview regarding the School's rise in admissions and national rankings. 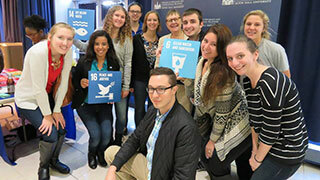 Paula Franzese was a feature presenter at the 14th annual International Human Rights Summit held at the United Nations. Law Professor Paula Franzese's research has spurred federal legislation from Sen. Cory Booker to protect tenant's rights. Named one of the best law teachers in the U.S., Paula Franzese has published "The Power of Empathy in the Classroom." Assistant Professor Dr. Zinaida Miller addresses anti-impunity and international human rights in a new publication. Law Professor Mark Denbeaux's most recent report on the wrongful conviction and execution of Ethel Rosenberg in The Nation. Law Professor Mark Denbeaux's report was featured on Fox News, NPR, the Daily News, Daily Mail and Democracy Now. Law Professor Paula Franzese published a study which examined more than 40,000 evictions and recommends systemic changes. Eviction defense for nonpayment of rent used in only 80 of more than 40,000 cases in Essex County. The School of Diplomacy co-sponsors a panel of UN experts examining the search for a new Secretary-General. Criminal Justice Professor John Paitakes is appointed to the State Parole Board. He shares fond memories as he retires. Law Professor Linda Fisher appeared on NPR’s Morning Edition, Marketplace and BBC World Service to discuss foreclosures.